Christy Carter nailed it. The chamber of commerce executive director predicted a sell-out crowd for the annual Legacy event. The moment that I stepped inside Pine Forest Country Club’s banquet hall, you could feel the electricity, enough to make the walls seem to pulsate. These days, the volunteer holding the gavel is called chairman. In 1980, when I took my turn, the title was president. Last Thursday night, outgoing chair Joy Burch-Meeks hosted a reception for former leaders of the Wayne County Chamber of Commerce. “What will I do when you are gone? There was Billie Clanton. The silver in our hair won’t let us hide our ages, but who cares? 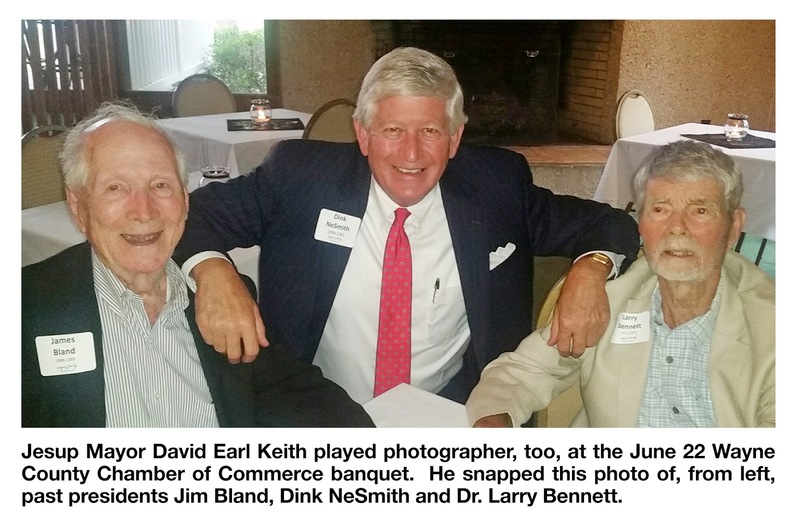 We’ve been paying our civic dues for a combined 100-plus years. He remembered the 1968 Dodge Coronet 440 Pope Henry sold me at Clanton Motors. I told him that I drove that sporty car on my honeymoon the next year. And I recalled stopping by his mother’s First Street store. With moist eyes, Mrs. Alene Kendrick said, “I can’t believe it. My boy is 30 years old today.” That was a “few” years ago, wasn’t it, Billie? One of my favorite Billie stories is about the farmer who bought a new truck every year. While Billie and his wife, Nell, were filling out the paperwork, the farmer went outside to perform his annual new-truck ritual. Swinging a metal pipe, he bashed the pickup. Walking back inside, the farmer always said, “Now, I don’t have to worry about when I’ll get that first bent fender.” You can’t make up stories like that. Two of my favorite storytellers are also past presidents of the chamber of commerce: Dr. Larry Bennett and Jim Bland. Sitting between them at a corner table, I laughed all the way through their back-and-forth banter. Doc will be 90 next month, and Jim’s 88. Both are still in tune with what’s going on in our hometown. Jim, retired Rayonier vice president, told of his one-day commutes to corporate meetings in Stamford, Connecticut. When CEO Ron Gross asked Jim why he didn’t just spend the night, Jim said, “I’d rather sleep in my bed at home than in the finest hotel in New York City.” I agree. Jim and I go back to my diaper days. In an old apartment house on South East Broad, he was a next-door neighbor to my parents. Once, they were short a babysitter, so Jim volunteered. We’ve known each other that long. And if ever there was a one-man chamber of commerce, Doc would be the lead pony in that parade. As a boy, I got to know him, sitting in his dentist chair. The building has been replaced with Rick Peel’s financial office, but my first memories of Dr. Lawrence Bennett Jr. are rooted on Cherry Street. How many Wayne County children learned to swim in Larry and Jann Bennett’s backyard? Ours did. And how many swimmers perfected their water strokes there? Too many to count, but one—Olympic Gold Medalist David Larson—spent countless hours in that South Palm Street pool.